Rosemary Grey joins Beyond The Hague again with a post on recent steps taken in Australia to bring the Government’s treatment of asylum seekers before the ICC. Rosemary Grey is a PhD Candidate at the School of Social Sciences, Faculty of Arts and Social Sciences, University of New South Wales. Rose can be reached at r.grey@unsw.edu.au and here. 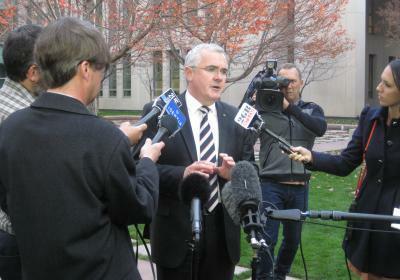 “Andrew Wilkie takes Australia to international criminal court”, the Guardian announced on Wednesday. Well yes, in a manner of speaking. Australia itself can’t be taken to the International Criminal Court (ICC), which has jurisdiction to prosecute individuals rather than States. And there are many, many steps that the ICC Prosecutor would need to take before any individual Government ministers could be summoned to The Hague. But Andrew Wilkie, an independent of member parliament in Australia, has taken an initial step to bring the Government’s treatment of asylum seekers before the ICC, as the Guardian’s report continued to explain. Specifically, Mr Wilkie has sent a letter to the ICC Prosecutor, asking her to investigate whether members of the Australian Government, including Prime Minister Tony Abbott and Minister for Immigration & Border Protection Scott Morrison, may be individually responsible for crimes against humanity under the Rome Statute.